Developing the application of reading and writing text files. Classes StreamReader and StreamWriter. In the application is demonstrated using of classes StreamReader and StreamWriter for reading and writing the text files. 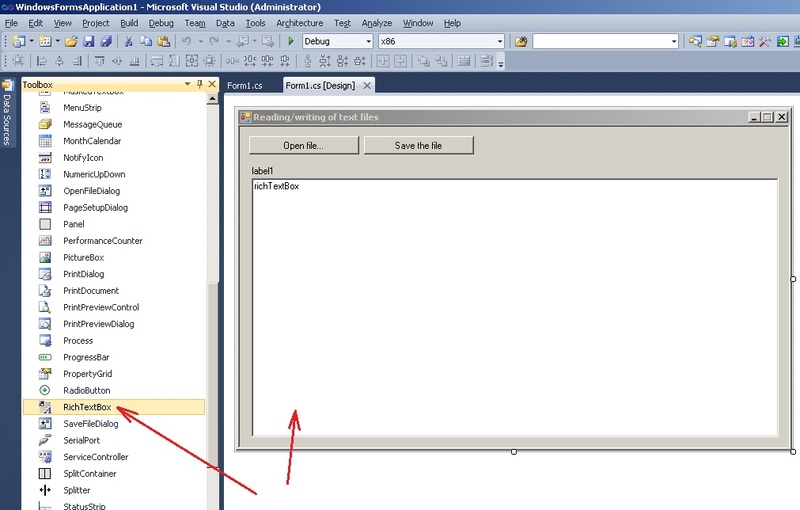 Also, in the application are used controls (components) RichTextBox and OpenFileDialog. 8. Programming the event of changing the text in component RichTextEdit. Develop the application of reading/writing text files. The application should be able to select the file for reading, correct it and write to the drive. Detailed information about, how to create the project is described here. Save the project under any name. Create the form as shown in Figure 1.
control of type Label. The object with name label1 is created. in the control “button2” property Text = “Save the file“. Also, you need to correct the size of form and controls on the form as shown in Figure 2.
property WordWrap = “false” (wrap the long strings within the borders of the editor window). The control “RichTextBox” is a multiline editor, that works with text in RTF format. 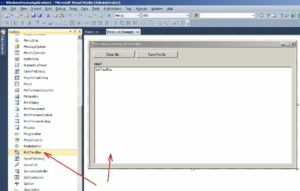 Text in RTF format saves additional service information, which manages by the properties of each paragraph and change the font in the text. To select the text file for reading, you need to use the control of type OpenFileDialog. This control is a standard dialog box for open the files. Place on the form the control OpenFileDialog (Fig. 4). 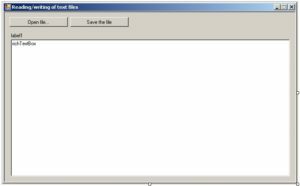 f_save – determines, whether the file was saved. Event “Load” occurs when the form is loaded immediately after the application starts to run. In the event handler is recommended to include the initial initialization of variables. 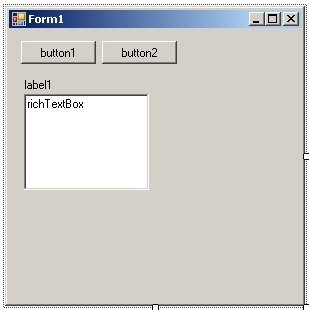 In this case, the initial initialization is realized for such variables and objects as f_open, f_save, label1, richTextBox1. In the component label1 will be showed path to the file. In the component richTextBox1 will be displayed the content (text) of selected file. In this paper to read and write files will be used the opportunities of StreamWriter and StreamReader classes from the C# class library. To call a standard window of selecting the file, user need to select the command “Open file …” (button1). 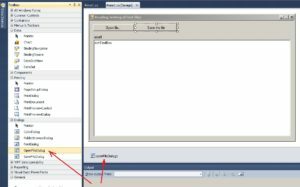 An example of programming of event of click on the button “button1” is described here in details. To call a standard window of selecting the file is used method ShowDialog() of component openFileDialog1. The selected file is saved in the property FileName of object openFileDialog. To read a text file is used class StreamReader, which realizes reading of symbol data from the file. To create an instance of class StreamReader is used method OpenText() from class File. Class File includes several methods, which are very good for simplify reading of symbol data. To read the string from file, in the program is used method ReadLine(), which reads the symbol string from current stream and which returns data as a string. If the end of the file, the method returns null. Reading of strings is carries out in the local variable line. To add a string in the object richTextBox1, you need to use method AppendText(). In accordance with the logic of the program, if changes occur in the text file, then f_save flag should be equal to the value false. In the component richTextBox1 there is the event TextChanged, which is called when text changes in the editor (Fig. 5). To save the changed text into a file, you need to select command “Save the file” (button2). 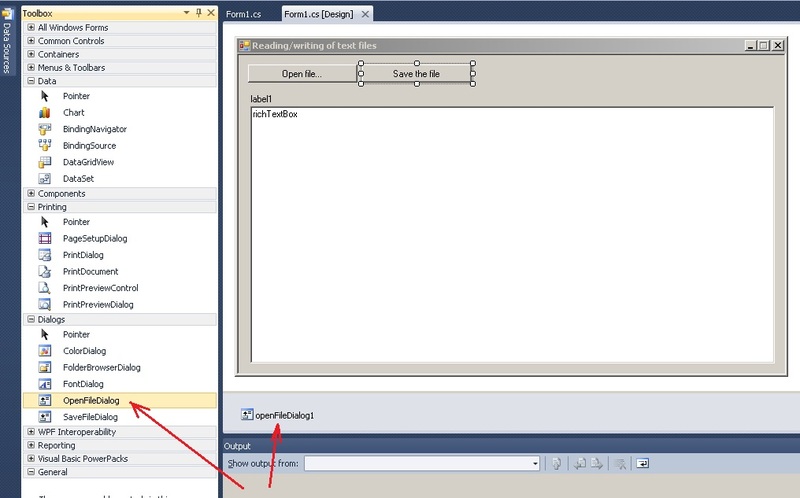 To save the file, which was changed in richTextBox1, are used methods from class StreamWriter. // 1. Check whether the file is opened? // 2. If the file is opened, the checking - whether it is saved. Let’s explain some code snippets. First of all, in the event handler button2_Click, is checked whether file is opened. Then is created the object (variable) with name sw of type StreamWriter. When the object is created, is used method CreateText() from class “File”. This method returns an instance of type StreamWriter. The file name is saved into the property openFileDialog1.FileName. For access to the entered strings is used the property Lines of component richTextBox1, which is an array of strings. To add a single string, you need to call method WriteLine() of object sw of type StreamWriter.